www.uk-car-discount.co.uk has Clio 182 Sport Cups in met black (not blue as in photo) at £12100, Passat Trendline 1.9 Tdi 100 Estates at £13620, Passat Trendline 1.9 Tdi 130 Estates at £14430, Passat Highline 1.9 Tdi 130 Estates at £16350, Avensis T-3X 2.0 D-4D Hatchbacks at £14400 Saving £3070, new VW Touareg 3.0 V6 Tdi Sport Tiptronic, many extras inc satnav £37800, Touereg 2.5 Tdi Tiptronic Auto many extras £30795, 55 reg Renault Megance CC 1.6s from £14,341, 2.0s from £15,110, 2.0 autos from £15,870, 2.0 turbos at £16,020 and 130PS diesels from £16,054, new Peugeot 407 X-Lines HDIs from £14,147, save £3,203, to 407 Zenith HDI 136 auto at £16,827, save £4,528, Facelift Mazda 6 1.8 TS 5-dr £13,220, 2.0 TS 5-dr £13,650, 2.0 TS Estate £15,140, 2.0 TS2 5-dr £15,720, Mazda 3 1.6TS 5-dr £10,800, Mazda 3 1.6 TS2 5-dr £11,500, Peugeot 206 206 CC Hdi 110 Sports at £12,728 Saving £1,967, 206CC 1.6 16v Allure Auto £13,775 Saving £2,220 and all 206CCs at similar discounts, Renault Clio 1.2 Extreme 4 3-dr with Metallic and Chilli Pack (a/c and CD player) at £7,300, saving £2,475, Citroen Picasso 1.6 Hdi 110 Exclusives at £11,600, saving £5,845, Volvo XC90 D5 163 Geartronics with leather and DVD entertainment system from £33,159, new for 55 reg RenaultSport Clio 182s with Cup suspension and spoiler for £12,200, New for 55 reg Volvo S40 1.6 S Diesel Euro 3 from £14,870, Volvo V50 2.0 Sport Diesel Euro 3 from £18150 and many other savings on the S40/V50 range. New Unregistered Renault Megane 1.5 Dci 86 Oasis 5-dr with a/c and panoramic sunroof £11,129, Saving £3,400. Many others include: new for 55 reg Citroen C4 2.0 HDi Exclusives at £15,645, Saving £3,200, new RenaultSport Megane 225 5 Door £16,000, Renault Megane 5 Door 1.6 VVT 115 Dynamiques at £10,338, Megane 5-dr Dci 86 Dynamiques at £10568, Megane 5-dr Dci 120 Dynamiques at £11715, Megane Scenic 1.9 Dci 130 FAP Dynamique £14,199, Grand Scenic 1.9 Dci 120 Privilege 7-seaters at £15,299. www.kia.co.uk has new model Rios from just £7,995, petrol or diesel. Diesel has 1,493cc 109PS chain-cam common rail engine, 0-60 11.2. Top speed 110. Mpg 60.1 combined. CO2 121g/km. (VED £115pa). Insurance Group 5. 5-door hatchback body, enough room for a 6 footer to sit behind a 6 footer. ABS with EBD. Twin airbags. Airconditioning. CD radio. Electric front windows, 60/40 split folding seats, rev counter, PAS, all the basic kit. And it goes, rides, grips and handles really well. 3 year unlimited mileage warranty. LX model has more kit for £8,995, petrol or diesel. Met paint + £300. 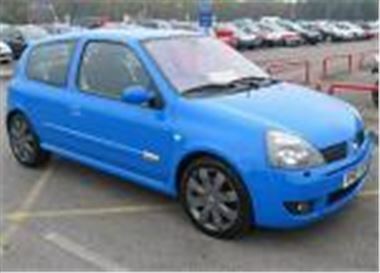 www.ukcarbroker.co.uk has new 2006 model Renault Clios from £7,599 for the 1.2 16v Extreme 3-dr, via £8,399 for the 1.5 dCI 68 Exreme 3-dr to £10,699 for the 1.5 dCi 106 Dynamique S 3-dr, new un-registered Citroen Picasso 1.6 HDI (110) Exclusives with leather and full length sunroof at £12,395. Also new UK supplied Toyota Avensis from £12,592, including the new 2.2 D-4D from £16,082. Also new UK supplied latest model Renault Megane Coupe Cabrios from Megane Cabriolet 1.6 Extreme and Dynamique (115) at £14,046, through 2.0 Turbo (165) Dynamique at £16,210 and 1.9 Dci (130) Dynamique Euro IV at £16,248 to 1.9 Dci (130) Privilege Euro IV at £17,048. Also new UK supplied Toyota Yaris 1.0 T2 3Drs £6,300, Toyota Yaris Colour Collection 1.0 3Dr £6,786, Toyota Yaris 1.4 D4D T3 3Drs £7,694, Toyota Yaris Verso 1.3 T3 £9,926, Toyota Yaris Verso 1.3 Auto T3 £10,745, Toyota Yaris Verso 1.4 D-4D T Spirit £11,472, Peugeot 206 Coupe Cabriolets from £11.871, from £12,921 for 1.6HDI 110 diesels, from £13,146 for automatics and from £13,743 for 2.0 litres. Also new UK supplied VW Passats from £13,569 for the 1.6 S through £15,480 for the TDI S 140 TDI to £19,039 for the 2.0 Sport TDI 140 DSG. Also new UK supplied Peugeot 307s from £9,067 for the 1.4E 3-dr to £13,989 for the 2.0 HDI 136 SW SE. Also Ford Fiesta ST150s at £10,800, Fiesta 1.25 Studio 3Drs at £6,560, Fiesta 1.6 Zetec Climate Tdci 90 3Drs £8,984, Fiesta 1.6 Zetec S Tdci 90 3Drs at £9,641, new VW Golf 1.4 S 3Drs at £10,727, VW Golf 1.9 TDI 105 SE 5Drs DSGs at £15,820, VW Golf 2.0 TDI 140 GT 3Drs 4Motion at £16,598, VW Golf 2.0 GTI 200 3Drs DSGs at £20,605, new Renault Clio 1.2 Dynamique 5-drs (no a/c) at £7,657, big discounts on most Peugeot 206s including the 206 GTI 1.6 HDI 110 at £11,143, all UK supplied. www.drivethedeal.com has new Toyota Yaris 1.4D4D T3 5dr £7,995 Save £2,425, Toyota Yaris 1.4D4D T Spirit 3dr £8,495 Save £2925, Toyota Yaris 1.4D4D T Spirit 5dr £9,495 Save £2425, Toyota Avensis D4D T Spirit 5dr £16995 Save £3475, Megane Sport Hatch 1.5 dCi 86 Oasis Euro 4 at £9,888, Megane Hatch 1.5 dCi 86 Oasis Euro 4 £10263, Clio 1.2 Extreme 4 3dr £6308, Clio 1.2 Expression 3dr a/c £6619, Kangoo 1.9 dCi 80 Trekka 4x4 £11051, Modus 1.4 Dynamique 5dr A/C £8811, Scenic 1.9 dCi Dynamique £14075, Grand Scenic 1.9 dCi Dynamique £14865, Megane Coupe Cabriolet 1.6 Dynamique £15438, Laguna Hatch 1.9 dCi 130 Expression £11864, Laguna Sport Tourer 1.9 dCi 130 Expression £12564, new Honda Accord 2.2 CTDi Sports at just £16,430, new model SEAT Leons from £10,728 for 1.6 Essence to £16,322 for 2.0TDI 140 DSG Sport, saving £572 to £993, new Volvo XC90 2.4 D SE Geartronics at £31,992, saving £2,483, XC90 D5 SEs at £32,268, saving £2,492, Volvo XC90 2.4 D5 SE Geartronics at £33,578, saving £2,532, Citroen C2 1.1 Design £6177, Citroen C3 1.4 HDI £7435, Berlingo Multispace 1.4 Forte £7164, Picasso 1.6LX £9287, C4 Coupe 1.6 VTR Plus £11194, Citroen C8 2.0HDI SX £16905, Renault Clio 1.2 Dynamique 3drs with met paint at £6767, saving £3118, RenaultSport Clio 2.0 182s with Cup Spoilers, Cup suspension and met paint at £13230, saving £1965, new VW Golf Plus models at a £2,500 saving until 30th September, for example Golf Plus 1.6 SE FSi 5dr £13592, Golf Plus 1.6 SE FSi 5dr Auto £14739, Golf Plus 2.0 GT TDi 5dr £15957, Golf Plus 2.0 GT TDi 5dr DSG £17126. Also new Citroen C2 1.1 L at £6277, C2 1.1 SX at £7402, C2 1.4 SX at £7851, C2 1.6 VTS £9917, Passat 2.0SE TDIs at £17,163, Golf Plus 2.0 GT TDi £16,486, Audi A6 Avant 2.0 TDi SE £23,651, Mazda 3 2.0 Sport 5dr £13,733, Mazda 3 1.6 TS2 5dr £12,031, Seat Ibiza 1.2 SX 3dr £8,096, Seat Ibiza 1.9 TDi FR 3dr £12,348, Seat Ibiza 1.9 TDi Cupra 3dr £14,631, new model Lexus GS 3.0 Auto saloons at £27,678, new Lexus GS 3.0 SE Auto saloons at £32,628, Lexus RX 3.0 SE Auto SUVs at £31,628, Lexus RX 3.0 SE Auto SUVs with Navigator satnav at £33,649, Mazda 5 2.0 Sports at £14,835. Other July 2005 special deals, in price order: FIAT Panda 1.2 Dynamic £5808, Toyota Yaris 1.3 Colour Collection 3dr £7249, Peugeot 206 1.1 S 3dr £7396, Honda Jazz 1.2 DSi S £8276, SEAT Altea 1.6 Reference £10,072, Skoda Fabia 1.9 TDi PD 130 vRS £11,281, Citroen C4 1.6 HDi SX 110 £12,178, Citroen Picasso 1.6 HDi Exclusive £12,639, Ford Focus 1.6 Zetec 5dr (Climate) £12,120, Mazda 3 1.6 TS2 5dr £12,031, VW Golf 1.6 SE FSi 5dr £13,653, Vauxhall Astra 1.8 Convertible £14,691, , Toyota Corolla Verso 2.0 D-4D T3 £14,910, Renault Megane CC 1.9 dCi Dynamiique £15,650, Skoda Octavia 2.0 TDi Eleg Estate £15,959, VW Golf 2.0 GT TDi 5dr £16,028, VW Golf Plus 2.0 GT TDi 140 £16,486, VW new Passat 2.0 SE TDi 4dr £17,228, Honda CRV 2.0i-VTEC Sport £17,331, Audi A3 2.0 TDi 140 Sport 3dr £17,976, Honda Accord Tourer 2.2i CTDi Exec £19,679, Jaguar X-Type Estate 2.0d SE Eu4 £20,962, Audi A4 Avant 2.0 TDi SE £21,198, Audi new A6 Saloon 2.0 TDi SE £22,256, BMW 523 SE Auto Saloon £25,635. Picasso 1.6 HDi 110 Desire £11400, 2005 55 Plate VW Passat 1.9 TDi 130 Highlines with leather at £14450, Fiat Punto 1.2 Active 3-drs at £6,000 and 5-drs atr £6,500 (both on sensible rate PCPs), Toyota Avensis 1.8 Colour Collection 5-dr at £12,000 Save £1,995, Avensis 2.0 D-4D Colour Collection 5-dr £12,727 Save £,2018, Avensis 2.0 D-4D T3-X 5-dr at £14,525, Save £2,620, Avensis 2.0 D-4D T-Spirit 5 Door at £17,000 Save £3,895, Vauxhall Corsa 1.2 SXi Plus 3-dts at £7,000, Save £3,330, Corsa 1.2 SXi Plus 5-drs at £7,850, Save £3,140, Mazda 3 1.6 TS 5-drs at £10600, Save £2350, Mazda 3 1.6 TS2 5-ds at £11350, Save £2400, Mazda 3 1.6 TS 110ps Diesel 5-drs at £13450, Save £1500, Vauxhall Corsa 1.2 16v SXi Plus models at £7,000 for 3-dr, £7,850 for 5-dr, £8,000 for 3-dr with a/c and £8,088 for 5-dr with a/c. Also new for 55 reg VW Golf 1.6 FSi S 5 Doors at £13,072 Save £1,138 to VW Golf 2.0 GT TDi 140 5 Doors at £16,249 Save £1,571, new Alfa Romeo GT 3.2 V6 Lussos at £24,013, 2.0GTS Selaspeeds at £21,208, 2,0 JTS at £19,508 and 1.9JTDs at £18,928. Also 05 reg 147 1.6 T Spark Lusso 3 Door £11700, 05 reg 147 2.0 T Spark Lusso 3 Door at £13700, new Nissan Pathfinder 2.5 DCi S at £23,570, Pathfinder 2.5 DCi SE at £25262, Pathfinder 2.5 DCi SE Auto at £26484, Pathfinder 2.5 DCi SVE at £27575, Pathfinder 2.5 DCi SVE Auto at £28797, Pathfinder 2.5 DCi T-Spec at £29831, Pathfinder 2.5 DCi T-Spec Auto at £31053, Volvo XC90 2.4 D5 SE Geartronic with Leather from £33159, Save £2,400, Renault Grand Scenic 1.9 DCi 130 Dynamiques at £14.578 Save £4,442, Scenic 1.6 Expresion £12,174, Scenic 1.5 DCi 100 Dynamique £13203, Toyota Landcruiser 3.0 D-4D LC3 5 Door £26357, Landcruiser 3.0 D-4D LC3 5 Door Auto £27443, Landcruiser 3.0 D-4D LC4 5 Door Auto £30882, Landcruiser 3.0 D-4D LC5 5 Door Auto £34412, Landcruiser Amazon 4.2 TD Auto £42893, Peugeot 206 CC 1.6 Zests at £12219, and the full range through to the 1.6 HDI 110 at £14111. New UK supplied Ford Focus 1.4 LX 3-dr at £10336 Save £1909, Focus 2.0 Ghia 5-dr £13362 Save £2713, Ford Focus 1.6 TDCi Ghia 5-dr £13516 Save £2754. New UK supplied SAAB 9-3 convertibles from £21584 for the 1.8t Linear to £28127 for the new 2.8 V6 Aero Convertible. UK supplied Citroen Picasso 1.6i Desire £10,000 Including Met Paint, Picasso 2.0i Exclusive Auto £11,593, Picasso 2.0 HDi Desire £10,600, Picasso 1.6 HDi 110 Desire £11,400, new UK supplied Renault Clio 1.2 Extreme 3-drs at £6450, Clio 1.5 DCi 80 Dynamique 3-drs at £8322, RenaultSport Clio 182 at £12500 Including Metallic, Paint Cup Suspension and Spoiler. UK supplied Mazda 6 1.8 TS 5-drs at £12840, Mazda 6 2.0 TS 5-drs at £13240, Mazda 6 2.0 TS2 5-drs at £15430, Renault Megane CC 1.6 Extreme £13886, Megane CC 1.6 Dynamique £14261, Megane CC 1.9 DCi Dynamique £15761 (also low rate PCPs on these cars), new UK supplied Vauxhall Astra 1.4 Expresion 5-drs at £10000 Inc Met Paint, Astra 1.6 Life 5-dr £11366, Astra 1.6 SXi 3-dr Sporthatch £12611, Astra 1.7 CDTi Design 5-dr £14105, Astra 1.8 SRi 3-dr £13607, new UK supplied VW New Passat 1.6 FSi S at £13970, New Passat 1.9 TDi 105 S at £14722, New Passat 2.0 TDi 140 S at £15884, New Passat 2.0 TDi 140 SE at £17005. www.look4mycar.com has Renault Clio 182s with full Cup packs in Metallic Black Gold only at £12,199, Renault Megane 1.4 Oasis Sport hatch 3dr in Flame Red or Mercury Silver with 16” Nervastella Alloys £10,134, Chevrolet Kalos 1.4 SX 5dr Hatchback, 55 Reg, £6,995, including Metallic paint, Ford Focus 2.0 TDCi 136 EU3 5-dr Zetec Climate Pack with met paint at £13,795, Renault Megane Dynamique 1.5 dCi 106 EU4 5-dr in Ottoman Blue £11,099, Renault Megane 1.5 dCi 86 EU4 Oasis 5-dr with met paint, alloys, mats and flaps £10,999, two of the very last current shape MX5 1.8s available from £13,995 for an MX5 1.8 Icon in Chilli Orange and £14,995 for an MX5 1.8 Icon with black hard top and aluminium grille. Also, new facelifted Peugeot 307 range at discounts, starting at £8,875 for the 307 1.4E 3-dr, rising through £14,215 for the 180ps 6 speed Feline, to £14,675 for the XSi HDi 136 5-dr, new 55 reg Fiat Punto 1.2 Active 3drs UK dealer supplied at £5,345 and 5drs at £5,645, new RenaultSport Clio 182 with Full Cup packs & Metallic Paint at £12,199, RenaultSport Megane 225 Sport 5dr Cup Chassis/Leather & Metallic £15,899, Renault Clio 1.2 Extreme 4 3dr With Metallic & CD player £6,899, Renault Grand Scenic Maxim 1.9 dCi 120 Hessian Metallic, Comfort pack, Spare Wheel £15,995, Renault Laguna Sports Tourer 1.9 dCi 130 Dynamique 5dr Sat Nav/CD Changer/Pan Sunroof/17 Alloys £15,249, Renault Megane Oasis dCi 86 5dr Metallic Paint/16” Alloys, £10,995. Citroen Picasso 1.6 HDI Exclusive, met paint £11,745, new Picasso 1.6 HDI Desire with met paint, Full length Sunroof & Parking Sensors £11,399, new Picasso 2.0 Exclusive Auto with met paint, Full Leather Upholstery, Full Length Sunroof & Parking Sensors £12,799, FIAT Punto 1.2 Active with ABS in a choice of colours from £5,695, Renault Megane Coupe Cabrio Extreme 1.6 VVT 115 at £14,245, Dynamique 2.0 VVT 136 6 Spd at £15,445, Dynamique 2.0 VVT 136 Autos at £16,599 Plus the new Focus range at discounts of at least £2,000, starting with the Studio 1.4i 3dr at just £8,995, 1.6iLX 3-drs at £10,295, 1.6 TDCI 110PS Zetec 3-dres at £11,795. www.onlinecarslimited.com offers SAAB 9-5 Vector 2.01pt 5spd Manual Estate pre-reg £18935, SAAB 9-5 Linear 2.01pt 5spd Manual Estate pre reg £16935, Jaguar X-Type Diesel Estate 2.0d S 5dr (Eu 4) delivered no later than 29-9-05 £18095, Toyota Yaris 1.4 D-4D T Spirit Manual (Diesel) 3dr pre-reg £8495, Honda Civic 1.4i SE 5dr Manual pre reg £9935, Honda Civic 1.6i VTEC SE 3dr pre reg £9466, Honda Civic 1.6i SE VTEC 5dr Manual pre-reg £10,485, Honda Civic 1.7i CDTi SE 3dr pre reg £10311, Peugeot 407 2.0 Hdi 136 Zenith Saloon pre-reg £16256, Peugeot 407 SW SE 2.0 Auto pre reg £15936, Renault Clio Extreme 1.2 3dr new and unregistered £6347, Renault Clio Authentique 1.2 5dr new and unregistered £6041, Renault Laguna Dynamique 1.9 dci 120bhp Hatch new and unregistered £13182, Renault Laguna Sport Tourer Dynamique 1.9 dCi 120bhp new and unregistered £13835, Renault Grand Scenic Dynamique 1.6 new and unregistered £12265, Renault Grand Scenic Privilege 1.9dC1 130bhp new and unregistered £14535, Renault Scenic Dynamique 1.9dCi 130bhp new and unregistered £13135, Renault Scenic Expression 1.6 new and unregistered £11215, Renault Scenic Privelage 1.9dCi 130bhp new and unregistered £13835, Skoda Superb Diesel Saloon 1.9 TDI PD 130 Classic 4dr delivered no later than 29-9-05 £13912, Skoda Fabia 4dr Saloon 1.4 16V delivered no later than 29-9-05 £8436, Skoda Fabia Diesel Hatchback 1.4 TDI PD Ambient 5dr delivered no later than 29-9-05 £8978, Skoda Fabia Diesel Hatchback 1.9 TDI Elegance 5-dr delivered by no later than 29-9-05 £10349, Skoda Fabia Estate 2.0 Elegance 5dr delivered no later than 29-9-05 £10923. www.autofinders.ltd.uk has new for 55 reg UK supplied Skoda Superb 1.9 tdi 130 Comforts in stock at only £13,750, new for 55 reg Skoda Fabia VRs TDi 130 at only £11,275 on the road, Citroen C3 1.6HDI 110 Exclusives at £9,995, new UK supplied Peugeot 307CCs fdrom just £13,995, which is the lowest price I've yet seen for genuine UK supplied 307CCs. Also new UK supplied KIA Sorentos at £3,000 off list, new UK supplied Skoda Superb 1.9TDI PD 130 Classics in stock ready to drive away today at only £11,995 on the road including 3 years Skoda warranty and 3 years AA cover. Also a fresh batch of Peugeot 307 Coupe Cabriolets from just £14895 on the road including 3 years Peugeot warranty, new UK supplied Citroen C4 coupes in stock and ready to go for just £8495 on the road including 3 years Citroen warranty. Also UK supplied Mazda 3 2.0 16v Sports at £12,995, UK supplied 05 reg KIA Sorentos at a £3,000 saving, new Skoda Fabia vRS 130s for just £10,995, new Skoda Octavia vRS 180s at £12,995, new Mazda6 Sport 136 diesels at £15,995, and new Renault Megane Coupe Cabrios from £14,495. www.cargiant.co.uk 54 reg VW Golf 1.6FSI S 5-dr: from £9,799, 54 reg CityRover 1.4 Select, a/c. CD: from £3,999, 54 reg Ford Ka 1.3ohc, met paint: from £4,499, 04 reg Corsa 1.2 Design, a/c, CD: from £4,799, 03 reg VW Passat 2.0SE, a/c, alys, CD: from £4,999, 52 reg Clio 1.2 Extreme, s/r, alys, CD: from £3,999, 52 reg VW Polo 1.2E 5-dr: from £3,999, 52 reg BMW 318iSE, a/c, alys: from £6,999, 02 reg VW Passat TDI 130SE Estate, a/c: from £5,399, 02 reg Mercedes C180 Classic, a/c, CD: from £7,999, 51 reg Honda Accord 2.0SE, a/c , CD: from £2,999 and 3,806 more cars all on one West London supersite. payments and 10,000 miles per annum. New DSG Auto Contracts Facility - Instant Online Quotes Available On The Website. * See website for full details, APR 8.9% on all PCP subject to status. www.motorprovider.co.uk has new VW Golf GTi 200ps 5-drs in stock from just £17,395, new Peugeot 407 saloons and estates for 55 reg in stock at up to £6,000 below UK list, Nissan Terrano 2.7 TD SE II 5dr New 2005 Model unregistered Just £14595, save £6000 on new list price. Also freshly in stock, all brand new: imported VW Golf 2.0 GT TDI 140 5-drs, choice of colours, just £15,495. Brand new VW Golf 2.0T 200PS GTI 5-dr, heated seats, electric folding mirrors, cruise control, Only £17,995. Brand new for 55 reg Nissan Pathfnder 2.5DI SE autos, just £24,995. Brand new Renault Scenic 1.6i Dynamique 16v, Choice Of Colours, from £10995. Also Renault Megane 1.6 Dynamique Coupe Cabriolet from £13,850, Renault Megane 1.9 dCi Dynamique Coupe Cabriolet from £15,995, Renault Megane 2.0 VVT Dynamique Coupe Cabriolet from £15,795. www.kia.co.uk Summer Offers: Save £800 on the Cerato 1.6 GS hatchback from £8,995. Kia Sedona with £1,000 cash back and a free DVD player from only £13,995 (Special link: www.kia.co.uk/agreatsedonaoffer) All Kias available with £1 deposit and free seven-day drive-away insurance. 1 year's free insurance on Picanto. www.syukcars.co.uk is offering cut price Ssangyong Rexton 290E TDI 4x4s with towing capacity of 3.5 tons at just £17,499. Also Rexton 270SE at special on the road pricve of £20,150 with PCP finance offer £340 a month for 36 months: deposit £1,500, amount to finance £18,650, interest charges £1,690, total amount payable £21,840, final payment £8,100, APR 3.7%. www.newcarsonline.co.uk can offer new for September 55 registration:- Nissan Terrano 11 2.7 TD 5 Door Unregistered 7 seats Air Conditioning CD Player 17” Alloys Side Steps Privacy Glass 3 Year Nissan Warranty in stock colour choice £14895 OTR save £6500. Citroen Picasso 1.6 HDi Desire new diesel engine UK supplied in stock at £10045 OTR saving £6300, Citroen Xsara Picasso 1.6 HDi Exclusive new 110 bhp diesel UK supplied UNREGISTERED at £11595 OTR saving £6300 (Plus For ONLY £800 Full Leather, Sun Roof, and Rear Parking Sensor can be added. )Renault Clio 182 Sport (CUP OPTIONS AVAILABLE) at £11745 OTR saving £3500 UNREGISTERED UK supplied. Renault Scenic 1.5 Dci 86bhp £12195 OTR save £4000 UK supplied UNREGISTERED. Renault Megane Oasis 1.5 Dci 86 5 Door Alloy Wheels Mats and Flaps only £10795 UNREGISTERED UK supplied. Ford Fiesta ST 150 BHP £11195 UK supplied save £3000. www.nissan-offers.co.uk has a Micra Sport + special based on the new, improved Micra Sport, with the Urban Sport Pack, at a total saving of £1,735 on list price for the Sport with Urban Pack. Spec includes: Integrated drive computer, leather steering wheel with drive computer and other controls, electric door mirrors, one touch electric up/down front windows, passenger vanity mirror, body colour door mirrors, handles, roof spoiler and side spoilers, tinted headlamp covers, sport bumper, sport gear lever, front foglamps, under passenger seat secret storage area, dashboard integrated 6 CD changer audio system with 6 speakers, 13 litre multi-functional glovebox with A4 slide-out tray, 16” alloy wheels, aluminium look pedals. air-conditioning. Prices: Sport + 1.2 3-dr £8,795, Sport + 1.4 3-dr £9,095, Sport + 1.5 82PS diesel 3-dr £9,875. www.autobytel.co.uk has a sale of pre-reg Smarts: Roadster Light £8,994, Roadster Coupe 80PS £11,994, ForFour 1.3 Pulse Manual £8,494, ForFour 1.5 Petrol Passion Softouch £11,494. Plus new cars: Toyota RAV-4 2.0 XT3 3dr £16,439 Saving £1,556, Jaguar X-Type 2.0d Classic (EU4) 4dr £18,717 Saving £2,258, VW Golf 1.4S 3dr £10,779 Saving £1,066, Vauxhall Corsa 1.0i 12v 3dr £6,294 Saving £2,271. Plus many more. www.motorpoint.co.uk has new, unused City Rover 1.4 Sprites at £4,699, a 54 reg Vectra CDTI 1.9 SRI 150 at £11,299, new Renault Megane CC 1.6VVT Dynamiques from £13,999, a 54 reg Ford C-Max 1.6TDCI LXs at £8,999, a 2,290 mile 54 reg Ford Ka 70 at £4,499, a 9 mile 05 reg Ford Street Ka Luxury at £9,999, a new Alfa GT Coupe 2.0JTS at ££18,499, a new BMW 120dSport at £18,999, an 05 reg BMW X5 3.0d Sport at £39,999, new Honda Accord 2.0i-VTEC Executive autos at £15,999, a new Jaguar S-Type 3.0V6 SE auto at £26,999, a new Landrover Discovery 3 2.7TDV6 auto at £31,999, a new Colt Lancer 1,6 Equippe estate at £7,999, an 05 Nissan X-Trail 2.2dCi 136 Sport 6-speed at £14,999 and thousands more at three sites in Derby, Burnley and Glasgow. www.www.buymynewcar.co.uk offers for Immediate Delivery just one RenaultSport Megane 225 Cup at a mere £14,495 OTR, just one Renault Megane dCi 106 Euro IV Dynamique 5dr in Mercury Silver with Comfort Pack at £11,599 OTR, saving over £4,000. That's a Saving of £4,036 on UK list. Also new RenaultSport Megane 225 3drs, UK Supplied, at just £14,999 OTR, new Citroen Picasso 1.6 HDi 110 Desires with CD player and aircon at an incredibly low £10,199. Also Cheap Contract Hire: Renault Clio 1.2 3dr Extreme with single CD Player £114.99 Plus VAT (based on 3 + 23 monthly payments). www.nissannavara.co.uk has announced very keen prices for its excellent new 174PS 4x4 pick-up. They start at just £14,695 + VAT for double-doored King Cab, and from £15,745 + VAT for the double cab. Standard models have 6-speed manual boxes with electrically selected part time four-wheel drive via an easy to use rotary dial on the dashboard. There are high and low ratios. Nissan also fits as standard a limited slip differential as well as anti-lock brakes with electronic brakeforce distribution and Brake Assist, twin airbags and a single CD audio system. Plus there’s a choice of pillar-less double doored King Cab version with rear-hinged rear doors and fold down jump seats, or the crew friendly Double Cab. A metal guard is fitted to protect the rear window to which tools can also be tied, while a tubular rear bumper allows this Navara to be loaded by a fork lift. Manual air conditioning is optional for £450. £16,095 and £17,195 (+ VAT) buys SE versions with side bars and chunky chrome back bumper. Body coloured front bumper. Chrome grille. 17" alloy Pathfinder wheels, electronic climate control, leather steering wheel, electric and heated door mirrors, fold flat passenger seat, and active front headrests. Optional £200 C-channel system of five rails to the load bay into which self-locking cleats can be placed to provide fixed points for securing ropes. £16,995 and £18,195 (+ VAT) buys the Outlaw, which has C-channel as standard. Also roof rails, automatic headlamps, headlamp wash, rain sensing windscreen wipers, trip computer, cruise control, front fogs, a 6CD autochanger with steering wheel controls and rear dark tinted glass. Outlaw options include £1,700 Hitech Pack for King Cab or DVD satellite navigation, a premium audio system with MP3 compatibility, Bluetooth mobile phone connectivity plus front side and curtain airbags. Or £1,375 Double Cab Premium option pack of electric glass sunroof, front side and curtain airbags, leather seat trim, and electrically adjustable heated seats. £20,995 buys the Aventura with both Hitech and Premium Packs fitted as standard. What’s more, like the Outlaw Double Cab, buyers can choose five-speed automatic transmission for £975 making it the ninth of the nine different Navaras. Automatic transmission is a £975 option on the Outlaw and Aventura Double Cab. www.newcar4me.com has Vauxhall Corsa 1.2 16V SXi £7845, Peugeot 206 HB 1.4 S £8745, Mazda 6 1.8 TS £13045, Nissan Micra 1.2 S £7345, Fiat Punto 1.2 Active £6045, Mazda 6 2.0 TS2 £14295, Renault Clio 1.2 Rush £7145, Honda Stream 2.0i Vtec SE SPORT £15951, Toyota Yaris T2 VVT-I £6995, Vauxhall Corsa 1.3 Cdti SXi £8495, Honda Civic 2.0 Vtec Type-R AC £16256, Nissan X-Trail 2.2 DCI (136) SE 136 £18295, Renault Clio 1.4 16V Dynamique [AC] £8445, Peugeot 206 1.1 Independence £6995, VW Passat SE TDI PD 100 £14595, Peugeot 206 1.6 Zest £12495, Peugeot 407 2.0 SE Auto £14995, Volvo S40 2.0 D SPORT £16995, Volvo S40 1.6 D SE £16595. Mitsubishi L200 Pick-Up 2wd 2.5 Td 4work 05 @ £158.99 over 36 Months. Volkswagen Caddy-van 2.0 Sdi C20 69ps @ £184.99 over 36 Months. www.nissan-offers.co.uk includes cheap new Micra 160SR from 1 June 2005 at £9995 for 3-door and £10,645 for 5-door. 110PS. 0-60mph 9.5 seconds. 42.8mpg on the combined cycle. Stiffer, lower suspension, dynamic ESP, deep front spoiler with integrated projector fog lamps, body coloured roof and side spoilers, dark tinted headlamps and graphite finished 16" alloys. Side curtain airbags, aluminium pedals, white dials, Intelligent key, six speaker CD system, automatic wipers and lighting plus air-conditioning – all as standard. Optional sunroof at £375. www.used-car-discount.comhas great deals on a large stock of used cars including: Nissan Micra 1.0 S 02/02 in met black, 5 dr, 36k with full service history £3500; Peugeot 206 1.6 Roland Garos 00W in met green with cream leather interior 5dr 28k with full service history £4250; MGF 1.8 convertable 95 N in white with black leather, alloys, 64k with full service history £4000; Renault Megane 1.6 Rt Automatic 96P in met red 64k 5 dr with full service history £2000; Nearly New Renault Megane 1.9 DCi dynamique 05/05 in met silver 5dr 3500 miles Huge saving on new £11,000. www.nissan-offers.co.uk has Patrol SVEs at £28,250, a £1,800 customer saving and is offering 3 years free servicing to X-tril owsners who upgraded to the latest X-Trails, now fitted with standard cruiser control and, on the SVE, Birdview Satnav. www.nissan-offers.co.uk has Almera Flare 1.5 3-doors at at £8,995, which is £1,255 less than the S for a car that comes with standard rear parking sensors as well as the twin airbags, ABS, remote central locking, air conditioning, electric front windows and 6 speaker CD radio of the S. An extra £1,000 buys an Almera Flare Extra with 16" alloys, front fogs, side airbags, active hear restraints, climate control and rear electric windown in the 5-door. The Almera Tino Flare is £2,580 less than the Tino S, with the same equipment. While the Tino Flare Extra gets the same extras, plus leather and Alcantara upholstery and an electric sunroof. www.nissan-offers.co.uk/micra.asp is offering the Micra Urbis 1.2 with £1,335 City Pack of 15" alloy wheels, rear parking sensor and airconditioning, plus "titanium finish, tinted headlamps, black rear roof spoiler and sculpted front seats in sporty INDY fabric" from £8,495, saving £2,190. Also 1.5DCI 82 Urbis from £9,595. www.trader4ukcars.com has Mercedes ML500 Auto at £41,650, save £7,670, Mercedes ML350 Auto at £31,750, save £6,500, Mercedes ML 270CDI Auto at £31,850, save £6,005, pre-registered Ford Galaxy 1.9 TD Ghia 130ps in various metallic colours at just £17,385 OTR with 1 yr VED, pre-reg Ford C-Max 1.8 Zetec 125ps in various metallic colours at £11,100 OTR with 1 yr VED, BMW 530D Sport Auto from stock at savings of over £3,600, new UK supplied Renault Modus 1.5DCI Dynamiques at £10,579, saving £1,270,61, new RenaultSport Clio 182s at £12,902.68, saving £2,122.32, new Nissan Micra 1.2 URBIS 3drs with City pack of a/c, rear park assist and 15" in solid colours for £7,595 and metallics for £7,995. Also new Mercedes S320CDi L, Tanzanite Blue/Sand leather £49,995, Saving £7,900, new Mercedes-Benz C270CDi Avantgarde SE at £26,290.30, new Golf 2.0 GTTDI 140bhp 5dr £16,755, new Golf 1.9 SETDI 5dr £14,725 saving £1,980, new BMW 530d Sport Saloons, Carbon Black, Black Dakota Leather, Save £4,487, new BMW 535d Sport Saloons, Carbon Black, Beige Dakota Leather, Save £4,732, Audi A3 Sportback 3.2 DSG quattro Sports at £23,869, New BMW 320CI Sport Auto convertibles at £28,905, new Mercedes C200CDI Sport Coupes from just £18,821 and new VW Passat 2.0 Trendlines at £13,715. All UK supplied and warranted. www.trade-sales.co.uk has a New Bentley Continental GT Coupe at £99,999, 54 reg Ford C-Max 1.6LX, a/c from £7,999, 04 reg Mondeo 1.8LX from £7,999, 04 reg Focus 1.6 Zetec from £6,999, 54 reg Cotsa 1.2 CDTI Energy, a/c from £5,999, 05 reg Picasso 2.0HDI Desire from £9,999, 04 reg SAAB 9-5 2.0t Vector from £11,999. www.toyota.co.uk offers new Colour Collection Yaris with a/c, metallic paint, rear spoiler, colour keyed trim, 4 speaker CD radio, front fogs, ABS, front and side airbags, and leather steering wheel with audio controls from £7,995. New Colour Collection Corolla with a/c, metallic paint, 4 speaker CD radio, electric windows, 15" alloy wheels, front fogs, ABS, front, side and curtain airbags and remotge central locking from £10,995. New Colour Collection Avensis with colour matched bumpers, mirrors and door handles, chrome grille surround and metallic paint from £13,995 for the 1.8 VVT-i manual hatchback or saloon. www.citroen.co.uk/offers is offering C1 1.1iLs at £5,995, saving £2,000 and making this the cheapest new car you can buy with a speed warning buzzer; C3 1.1 Desires at £7,495, saving £2,400; C4 1.4 16vLXs from £9,995, saving £1,500 and Picasso 1.6LXs at £9,995, saving £3,400. www.newskodafabia.co.uk hs new Fabias with ABS, aircon and twin airbags from £6,995. www.car-brokers.net has new UK supplied Toyota Avensis Verso T Spirit 2.0 D-4D 115bhp at £19849, plus 12% off list off all Avensis and Avensis Verso. Aldo Audi TT 150 Coupes at £19,189, Audi A4 2.5TDI Cabrios at £25,377 and VW Golf Mk V 1.4S 3-drs at £10,861. www.vauxhallmotors.com is offering the last batch of Fronteras built them at discounts of up to £7,335. Alto from £4,999 with 4 doors, PAS, ABS with EBD and central locking. £2,000 off the price of the Grand Vitara 1.6 3-dr now down to £9,999 on the road. Grand Vitara 5-dr on 0% finance with £5,447 deposit and 48 payments of £199 (total £14,999). Grand Vitara XL-7 2.0TDI 5-seater on 0% finance with £8,447 deposit and 48 payments of £199 (total £17,999). Igis 1.5 GLX 4Grip four wheel dricve supermini on 0% finance with £3,267 deposit and 48 payments of £134 (total £9,699). Alto 5-door on 10.2% APR finance with £254 deposit, one payment of £125, then 58 monthly payments of £99 (total £6,280). All UK Suzukis come with a 3 year 60k mile warranty and 24 hour roadside assistance anc recovery package. Is offering £2,000 off 2005 modely year Freelander TD4s to 30-9-2005.
www.Vauxhall.co.uk up to 30-9-2005 is offering Corsas from £6,995 for the 1.0 Life with remote central locking, a stereo/radio CD player, electric front windows and ABS. For a limited period the Corsa SXi, comes with free TomTom GO300 portable satnav system. With no deposit and a year’s free insurance for drivers aged 19 and over, a Corsa 1.2 SXi can cost from only £185 a month on Vauxhall’s Choices finance scheme. Four-year 0% finance deal along with free insurance on the special edition Corsa Breeze, which gets air conditioning and alloy wheels as standard. Meriva Breeze 1.4i 16v 5-dr £9,995, save £2,305. Astra Breeze 1.4i 16v 5-dr £10,995, save £2,680. Astra Sport Hatch available with a £99 deposit and £99 insurance, starting from only £239 a month at 3.99% APR. A £99 deposit scheme is also available on the Astra SXi in both 5-door and estate form, while the special edition Astra Breeze is available with zero per cent finance over four years. Zafira (old shape) Life 1.6i 16v 50dr 7 seater £10,995. Vectra 1.8 Energy models at £12,740, Zafira 1.6 Life 7-seaters at £12,490, Corsa 1.0i Lifes at £6,995, Astra Coupe 1.8 16vs at £12,995 and Astra Convertible 1.8 16vs at £15,245, saving £3,250 on list. www.toyota.co.uk offers the Corolla Collection at a £1,400 saving from 1 July in Silver Steel and Ixion Blue metallic paint. Ixion Blue cars come with new Sandu design six-spoke 15-inch alloy wheels. Three and five-door hatchback, saloon and estate body styles are on offer with 1.4 or 1.6 VVT-i petrol and 1.4 or 2.0 D-4D diesel. On-the-road prices range from £10,995 for the 1.4 VVT-i three-door model, to £14,495 for the estate with the 2.0 D-4D engine. Standard features include air conditioning, front fog lamps, colour-keyed electrically adjustable door mirrors and front, front side and (except on estate models) curtain airbags. From 1 July Eclipse Black joins Silver Steel, Carlo Blue and Silver Fern in the Avensis Colour Collection range. Based on the T2 Avensis, the Colour Collection comes with colour matched bumpers, mirrors and door handles, eight-speaker sound system with CD player, air conditioning, trip computer, multi-adjustable front seats, remote central double locking with alarm and steering column adjustable for reach and rake and no less than 9 airbags, including a driver’s knee airbag. Saloon, hatchback and tourer body styles are on offer, with 1.8 VVT-i petrol or 2.0 D-4D diesel power. On-the-road prices are unchanged, starting at £13,995 for the 1.8-litre saloon and hatchback models. No deposit and 7.5%APR on PCP for Colt Red and Colt Black. Colt Red no deposit then £155 a month for 37 months. Other Colts come with 3 years or 37,500 miles free servicing worth £615.77. 50:50 'Alternatives' plan allows payment of 50% deposit, then balance at one year with no interest. Eg Colt 1.1 Attivo 3-dr £4,124.50 deposit, then £4,124 at 12 months to own the car. All Colts with optional sunroofs have £450 sunroof fitted free. Colt Space Star available on 50:50 'Alternatives', eg Spave Stat 1.3 Mirage pay £4,499.50 deposit and £4,499.50 after a year interest free, plus 3 years or 27,000 mied free serviciing on all Colts, worth £532.17. www.chevrolet.co.uk is offering a new deal called '3 and easy'. Pay one third of the list price on ordering, one third at the end of the first year, and one third at the end of the second year. No interst charges, no fees and no catches. www.skoda.co.uk has new model Octavias at discounts up to £1,200. www.citroencars.org.uk has Picasso 1.6 HDI 110bhp Desires at £10,995. www.nissan-offers.co.uk also include Micra 1.2SE 3-drs with a/c, electric front windows and door mirrors, ‘intelligent key’, driver, passenger and front side airbags, extra 15” alloy wheels, extra electric sunroof at £8,495; Almera 1.5SE 5-dr with climate control air conditioning, ABS, driver, passenger and front side airbags, electric windows and door mirrors, ultrasonic rear parking sensors, extra 16” alloy wheels at £9,995; Almera Tino 1.8SE 5-drs with colour rear parking camera, climate control air conditioning, ABS, extra leather/alcantara interior, extra front fog lights, extra 16” alloy wheels at £11,995; Primera 1.8SX 5-dr, climate control air conditioning, driver, passenger and front side airbags, ABS, CD radio, extra 17” alloys, extra colour rear view camera and Birdview DVD satnav at £14,495; X-Trail 2.2 dCi 136 SVE 5-dr with all mode 4x4, leather upholstery, power and heated front seats, climate control air conditioning, CD radio, panoramic electric glass sunroof, extra Birdview DVD satellite navigation at £21,995; and Navara 2.5 DI Sport double cab pick ups with climate control, ABS, 16” alloys and CD autochanger at £14.950 + VAT. www.seat.co.uk is offering up to £1,760 off the outgoing Leon range. The offer applies to Leon S and SX models. Standard equipment on Leon S includes air conditioning, electric front windows, radio/CD, ABS, alloy wheels, front fog lamps, body coloured bumpers, door handles and mirrors and remote central locking. The available engines are 1.4 75 PS and 1.6 105 PS petrol and 1.9 TDI 90 PS, and the offer prices are £9,250, £9,995 and £10,995 respectively, representing customer savings of £965, £1260 and £1520 on the corresponding models. The Leon SX is available with the same 1.6 105 PS petrol engine or a 1.9 TDI engine delivering 110 PS. Climate control, heated electrically adjustable door mirrors, electric rear windows, TCS, EDS and alarm are the functional gains, while sports seats, sports gear knob and leather steering wheel add to the style and comfort. The Leon SX 1.6 comes in at £10,495, a saving of £1760, and the 1.9 TDI at £12,250, a saving of £1715 on the recommended retail price. 0% finance offer on SEAT Ibiza bought between 1st Jule and 30th September 2005. Requites minimum 30% deposit and repayment over 2 years. Excludes Ibiza 1.2 referance and Ibiza Award. SEAT new car pricing is on the road, including one year’s road fund licence, first registration fee, three-year/60,000 mile warranty, 12-year body protection warranty and a 3-year SEAT Assistance roadside package including cover in over 30 countries in Europe and its borders. £1,700 customer saving and available on 7.9 per cent APR, no minimum deposit on Ford Acquire over 36 months, plus 1 years free insurance for customers aged over 21 years. £1,000 customer saving and available on 5.5 per cent APR, no minimum deposit on Ford Options over 36 months or Ford Acquire over 48 months (excludes ST). Fiesta now on the road now from just £7,295. Fiesta ST is available on 5.5 per cent APR, no minimum deposit on Ford Options over 36 months or Ford Acquire over 48 months PLUS a free Prodrive track day. £650 customer saving and is available and available on 5.5 per cent APR, no minimum deposit on Ford Options over 36 months or Ford Acquire over 48 months. New Focus on the road from £10,545. Focus Sport is free upgrade of 1.6 LX with alloy wheels, front fogs and leather steering wheel from £11,595, usually discounted by £800. £1,000 customer saving and available on 5.5 per cent APR, no minimum deposit on Ford Options over 36 months or Ford Acquire over 48 months. Drive away £9,245 and £12,695 respectively. £1,500 customer saving and available on 5.5 per cent APR, no minimum deposit on Ford Options over 36 months or Ford Acquire over 48 months. Mondeo on the road now from £14,495. Galaxy Silver, LX, Zetec and Ghia models available on 5.5 per cent APR, no minimum deposit on Ford Options over 36 months or Ford Acquire over 48 months. Prices of Thai built Ranger 4x4 double cab pick ups cut by £1,000 cashback and include a free Makita poer tool kit. Prices do not include on the road charges, delivery and VAT. www.best4cars.co.uk has new Renault Modus from £8,599, saving £1,800. Getz continues to start from just £5,995 on the road. Also a £2,150 saving on Getz 1.3 CDX 5-door, making it £7,495 on the road, with dual front and side airbags, ABS with EBD, remote central locking with an alarm, striking 14-inch alloy wheels, air-conditioning and a stereo radio/CD player. Rest of the Getz range comes with 3 years free servicing until 30 September, including the 1.3 GSI 5-door auto, 1.1 CDX 5-door, 1.3 CDX 5-door auto, 1.5 CRTD GSI 5-door, 1.6 CDX 5-door and 1.6 sport 3-door, while stocks last. Matrix mini-MPV and Trajet MPV come with three years’ free servicing until the end of September 2005. Matrix 1.6 GSI is being offered with £1,000 saving, making it £9,995 on the road. Trajet 2.0 GSI comes with a £1,500 saving, from £13,995 OTR. Both Matrix and Trajet GSI have standard a/c. Hyundai remains the only UK range to offer a fully transferable unlimited mileage five-year warranty across its entire range. And every new model also comes with three years’ RAC cover as standard. www.simplyskoda.co.uk is offering up to 17% discount on current model Skoda Fabias and big savings on new 2005 model Octavias and 2005 Octavia estates. www.simplycontracthire.co.uk has MX-5 1.8 Arctic Convertibles with aircon, alloys, leather and CD player on 3+35 contract hire, 10,000 miles a year at £199.99 + VAT for business users or £234.99 including VAT for personal users. Also Mitsubishi L200 2.5 TDi Warrior Double Cabs on 3+ 35 contract hire from £269 + VAT a month. www.coventus.com has new EU Import VW Golf GT 2.0 FSIs with leather at £15,995 and Golf GT 2.0 TDIs with leather at £16,995. Cars in silver or black metallic. Also Golf 1.6 Fsi automatic £13,499, fabric upholstery. (All + £240 for reg tax, plates and VED).